Do you use a cloud eCommerce tool to sell your products? Do you manage your customers using online CRM? Are you managing your projects or your inventory online? 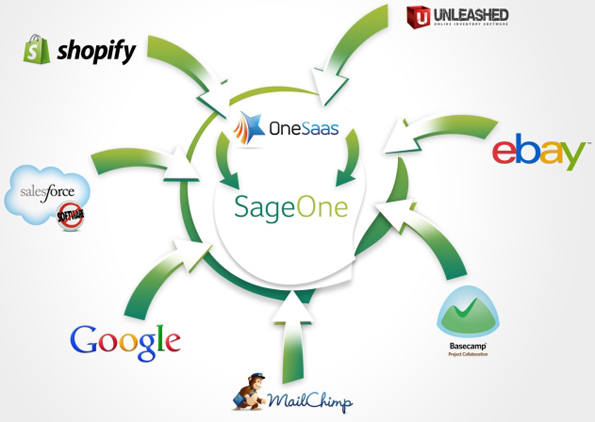 If so, you can probably integrate them and many other cloud services with Sage One Accounts by signing up to OneSaas. The guys at OneSaas noticed that the emerging cloud services had APIs and have made it their mission to connect them and synchronise their data so we’re very pleased that you can now use their awesome service with our Sage One Accounts software! So, if you use Sage One to do your accounts, Harvest for sending invoices, Highrise to manage your customers, Shopify to sell your products and Unleashed to manage your inventory – you can connect them all using OneSaas. The list of integrations is extremely impressive and the OneSaaas team is constantly adding new services to it. (If your favourite service isn’t on there, get in contact with them with your suggestion, I’ve found their customer service to be excellent). Read more about the service and connect OneSaas to Sage One here.